Our Meat & Cheese Gift Baskets are custom tailored after your order is received, assuring that your gift arrives fresh and delicious. Add your personalized gift message to your gift and you can send one of our themed Meat & Cheese Lovers Gift Baskets as a Thank You Gift or Special Occasion Gift! included with all of our Meat & Cheese Gift Baskets! Dad's Premium Pail of TreatsNo, we haven't started selling paint like Martha Stewart. We do fancy the can though. Whether it is the office, home, or outdoors - all Dad has to do is spread this out and paint a smile on his face. 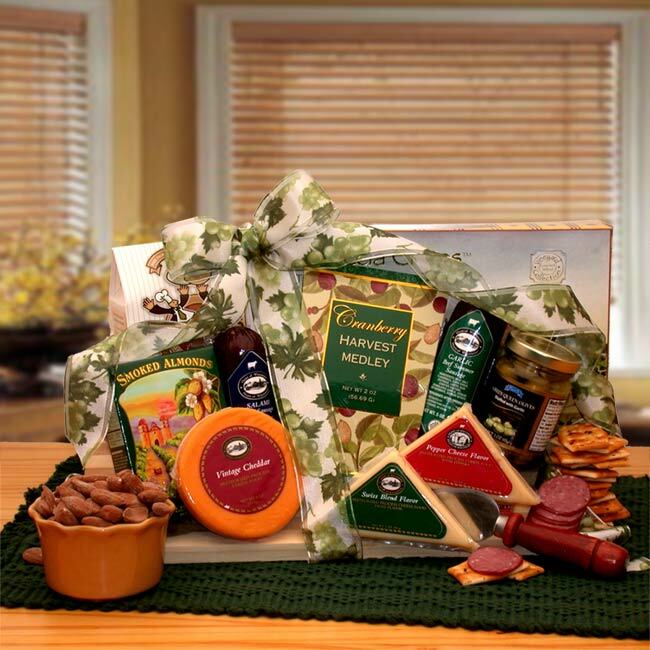 Dans Favorites Gift PackageAll the best selling sweet and savory snacks combined into a wonderful pine gift box. Includes Summer Sausage (9oz), Sharp Cheese (4oz), Pepper Jelly (5oz), Smoked Salmon (3.25oz), Smoked Pate (3.25oz), Spiced Almonds (1.5oz), Sweet'N'Hot Mustard (2oz), Crackers (1oz), Chocolate Truffles (2pcs), Chocolate Covered Cherries, Blueberries, Cranberries and Apricots (4oz). A Classic Selection Deluxe Meat & Cheese GourmetGive a delicious gift that's also sophisticated and satisfying. Arrives in an elegant basket with hand crafted bow. It’s pure heaven for your favorite gourmet foodie. The Baconator Gift Crate Do you smell bacon? A most unique gift for any bacon lover in your life. Real bacon jerky made from thick slab bacon, Snackle Mouth bacon maple clusters, BLT dip to eat with the Maple bacon kettle chips and more....You won't believe how much bacon is jam packed into this all wood pine crate with lid and rope handles. A truly one of a kind gift! The VIP Gourmet Gift ChestIncludes: A gloss stained gift hamper with handles, deluxe mixed nuts, chocolate Milano biscotti, smoked almonds, 5 oz sausage, Bavarian pretzel nuggets, cranberry trail mix, Parmesan flatbread crisps, shortbread cookies, chocolate cream filled Pirrouline wafer cookies, smoked gouda cheese swirls, gourmet Seattle blend coffee, Raspberry chocolate cake, smoked salmon fillets & more. Gourmet Snacking Favorites ChestA handsome executive traveling chest with antique brass accents, caramel corn, 7 oz salami, 7 oz Smokey beef sausage, salted almonds, Old fashioned vanilla caramels, chocolate chip cookies, salty snack mix, creamy Brie cheese spread...This is a gift fit for royalty!